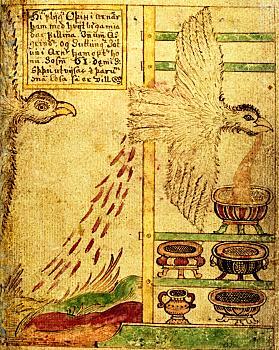 Illustration from a late Icelandic manuscript showing Óðin carrying the mead of poetry to Ásgarður. 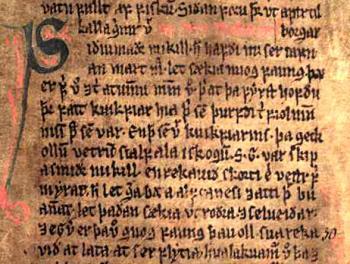 Have you ever wanted to read the sagas, or the eddas, or other Viking-age literature in the original language? Anyone with more than a passing interest in the Viking age should bypass the translator middleman who puts his own stamp on the material, and instead, go directly to the original. 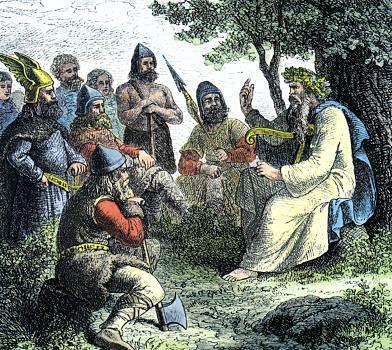 A Romantic illustration of a Viking-age skald and his listeners. 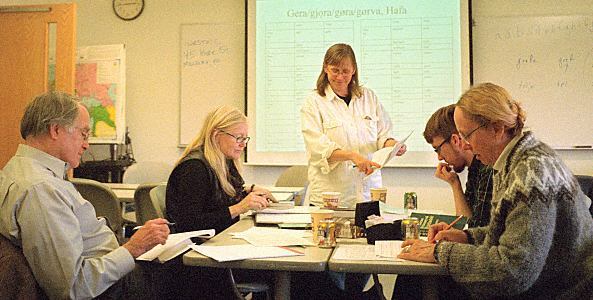 We offer a two-day introduction to Old Icelandic. 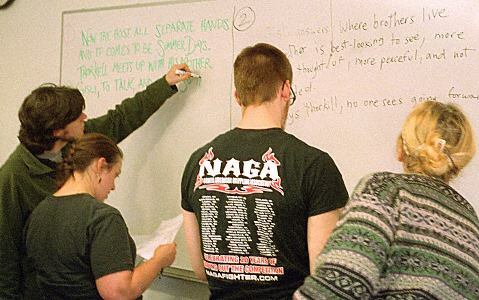 Students can expect to go from having no knowledge of the language to being able to use a dictionary, grammar chart, and other references to work out the meaning of passages from the original saga texts. For this session, we will be translating passages from the Snorra Edda. Snorri Sturluson wrote this book to serve as a primer for young poets of his day. We will be focusing on prose passages from Gylfaginning, the first section of the book. These passages tell stories about the Norse gods and goddesses, and of the beginning and end of the world. 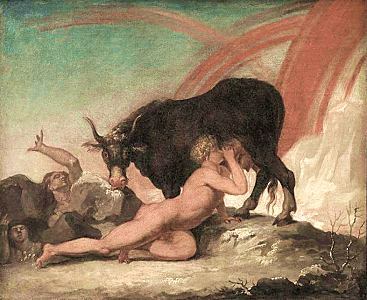 They form the basis for much of our knowledge of the Norse mythology. If you have taken the bootcamp before, when we used Grettis saga or Gísla saga for our passages, please consider joining us again to work with us on passages from Snorra edda. No other language knowledge is required, but experience in learning other languages, or extensive knowledge of modern English grammar will be helpful. 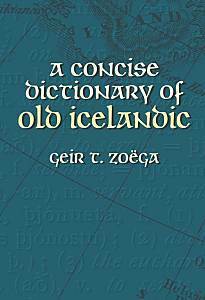 Students should bring with them a copy of Zoega's book, A Concise Dictionary of Old Icelandic. A inexpensive paperback reprint is available for about $28. The book has been published in many editions, and used copies of earlier editions are available for even less. There are on-line editions as well, but we recommend that students have a paper copy at their disposal. Other printed materials, such as grammar guides, a bibliography, and sample saga texts, will be given to students in the class. Other texts that might be useful are the four volumes of A New Introduction to Old Norse which may be downloaded at no charge from the Viking Society for Northern Research (Introduction, Grammar, Reader, Glossary). Additionally, the VSNR has a downloadable English translation of Gísla saga available. An excellent edition of Gylfaginning is available at no charge on-line from the Viking Society for Northern Research, and students may wish to consider downloading this PDF, although it is not required for the course since you will be provided with the excerpts we'll be translating in the class. Similarly, there is also a glossary available with an index of names, which may be handy since it is more extensive than the glossary you will receive in class. 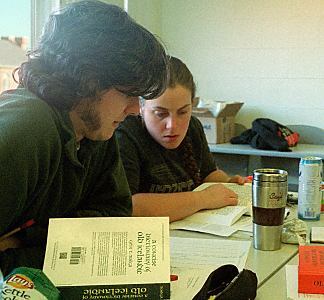 Students and instructor work together on a difficult passage. Students present their translations to the class. Class time is divided between lecture/presentations, and small group collaboration. The lectures introduce students to the funamentals of grammar, and to the use of the dictionary and grammar guides. But for most of the session, students will work in small, collaborative groups (right) to translate saga passages and then to present their translations (left) to the whole class for further discussion and refinement. 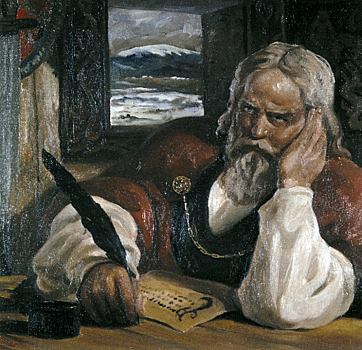 Additionally, there will be presentations on the a variety of topics related to the sagas, including: the society of saga-age Icelanders; the poetry of the sagas; the locales of the saga passages we are translating; the manuscripts that have preserved these stories for us to read today; and more. The class will run from 9AM-12N and from 1PM to 4PM both days. Morning and afternoon snacks will be provided and are included in the cost of the class. Lunch is available on-campus, or from nearby off-campus restaurants. Alternatively, students are welcome to bring a lunch. Students work on their translations in small groups. The instructors for the next session are tentatively Amy West, and William R. Short. Amy taught the bootcamp last year. She holds a MA in Medieval Studies from the University of Connecticut, and is now working towards a masters degree in Applied Linguistics at UMass Boston. 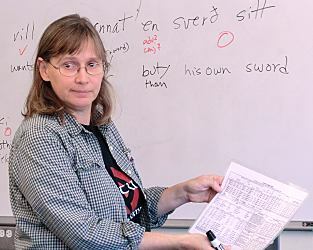 She currently runs the Hurstwic Old Norse Reading and Study Group. William is the manager of Hurstwic, LLC, and is an independent scholoar and the author of the book Icelanders in the Viking Age. 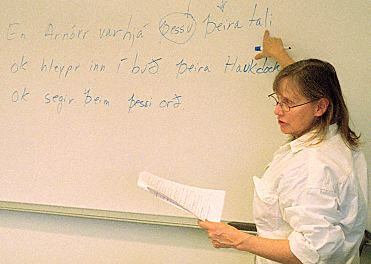 He has taught university-level courses on the sagas in Iceland. A photo album of the most recent boot camp session is here, in a public Facebook album. The fee for the class is $75 and must be paid in advance when you register and reserve your place. When a firm date have been set, you may register and pay using the link that will be available to the right. For more information, contact us at Hurstwic. Sadly, we do not offer an electronic version of the course, due to the highly collaborative nature of the class. Cancellation policy: We understand that things can happen, and if you cancel more than a week in advance of the class, we will gladly refund the full registration fee. After that, things get messy, since we will have procured the materials we will be giving students in the class. If we have a student on the waiting list to take your place, we will gladly refund your registration fee. Otherwise, it it will be decided on a case-by-case basis. For more information, contact us at Hurstwic. Hurstwic Old Norse reading and study group meeting. 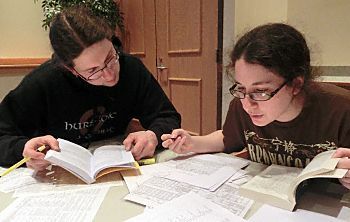 Students who complete the course will be in a good position to join the on-going Hurstwic Old Norse reading and study group, which meets monthly, with both in-person and electronic participation possible. For more information, contact us at Hurstwic. 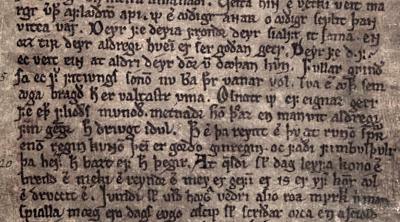 A manuscript leaf containing the poem Hávamál with the well-known verse "Deyr fé deyia frændr..." which expresses the need to uphold one's honor and good name in Viking society.